Simutowe places joint 1st in SW Open! International Master Amon Simutowe made good this past weekend at the SouthWest Open held in Dallas, Texas. The Zambian national scored 5½-1½ tying with IM Peter Vavrik (Slovenia) for joint 1st. Michal Kujovic and John Cole scored 5-2 for joint 3rd-4th. Simutowe, a student at University of Texas-Dallas (UTD), was studying for an exam during his participation and in doing so, may have missed a chance to improve his score. He pointed out that he missed a win against Kujovic in the penultimate 6th round encounter. With classes in full swing, UTD has also gained the services of National Master William Aramil, who won a UTD scholarship by virtue of winning the 2004 Denker Championship. Aramil scored 4-3 in his first Dallas tournament. 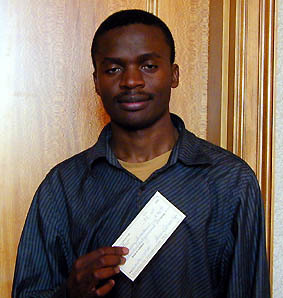 Amon Simutowe holds winnings from joint 1st in SouthWest Open.